We know you were wondering on Monday.....why did the orange kittens move?? The mom cat was left at the adoption center. A woman had found her and despite the rescue trying to get her spayed and cared for, the woman resisted. Until the mom cat showed up VERY pregnant. Unfortunately, she was malnourished and the kittens didn't survive. She was spayed and being cared for by the rescue. The lady did say she didn't think the cat was walking on her right back leg. The clinic gave her the once over and didn't feel any breaks. We are going to keep an eye on her and see if some rest helps. In the meantime, 4 kittens were left alone in a box at the local humane society after closing. They were anemic and covered in fleas. No mom in sight. Their fate was not going to be good. One died that same night. 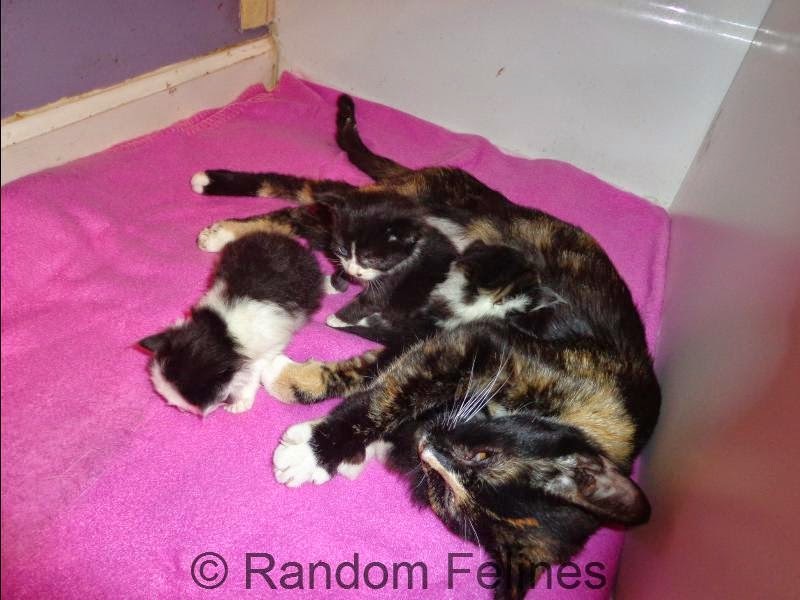 But....the other three were introduced to the calico mom and it was love. In fact, when mom got here and set them up, she got the mom cat out of the carrier first and she threw a fit until all the kittens were out. MOL Mom was a little worried about the tiny girl, but everyone is doing very well. Mom is keeping them close. And when mom put out canned food for mom on Sunday morning, all three kittens tried it. While they may not have been born to her, mom is taking VERY good care of these kittens....making up for those she lost. We have 2 girls and 1 boy. Two are black and white - what the kid (mom's niece) calls "moo kittens". We thought the other girl was too, but she is starting to show some brown stripes along the edges of the black. Unfortunately, the tiniest black and white girl started going down hill and despite the best efforts of mom and the rescue, she didn't survive. We tried Julep - and you were loved no matter how long you were here. And Sunday evening mom got a call from our friend Miss Beckie....seems some teenagers found a week old kitten and thought it would be easy - bring it inside and viola. Right.... Anyhow, Miss Beckie knew about Cass (she was the one who rescued the moo kittens) and so the tiny came over to our house. Cass took her right away. Mom is keeping an eye on everyone as the new girl is younger and smaller than the other kittens, but it is all good. The new girl is a brown and white tabby - with a white stripe down her spine. And it is that time of year again (might as well make it a tradition). So please help us welcome the third annual alcohol kitten crew. The little boy (the mainly black one in the upper picture) is Stoli. His sister is Sangria. And the newest tiny girl is Daiquiri. What a post! It breaks our heart that the mom's biological kittens didn't survive due to the neglect of this woman -- well, that she wouldn't have the cat spayed in the first place. And we're so sorry the tiny b&w kitten didn't survive. 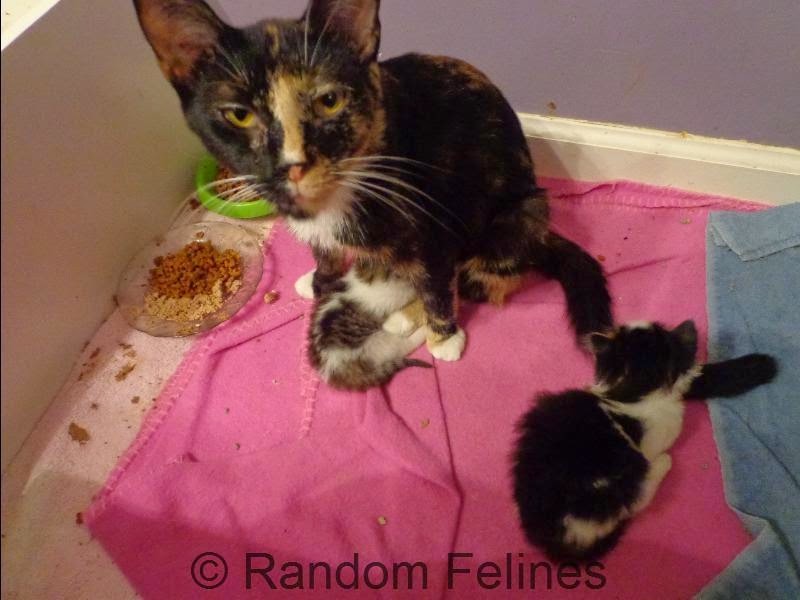 But Cass is a terrific mom after all, to take these other kittens in as if they were her own. Tiny Sangria already has captured our human's heart -- brown and white, shades of Chumley. Purrs to them all that they thrive and find wonderful and true forever homes in due course. I am just leaky eyed at the babies who couldn't make it, the mommy cat who had such a hard time and these rescued babies and she doing so well together and yes, I am going to say it again, YOU are an angel. geeze.. how many kittens does that make at your house this year? A lot of fostering going on - by humans and cats. What a wonderful tale. A happy Mom and warm and fuzzy kittens!!! 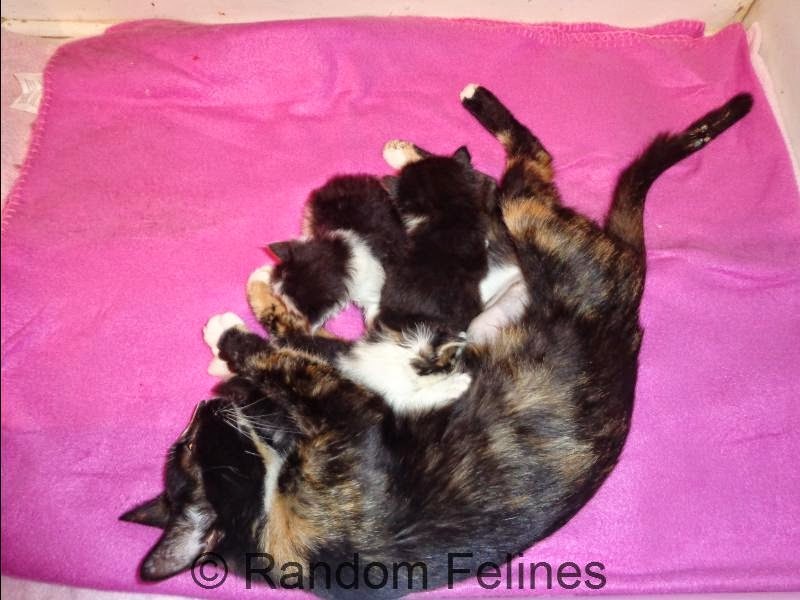 A wonderful story - we love new kittens and are glad they have a new mom. How sad about Cass's litter, but it's so wonderful that she's able to take care of the mixed litter and be a foster mom herself! It's sad that Cass's babies didn't make it, but how great that she can help some other babies that need it. I'm glad these kitties are safe with you, but the foolishness of some other humans really upset me. Cass is awesome to step for these kittens! It makes us sad that Cass' own kittens didn't survive. But it's lovely that she took the others in. 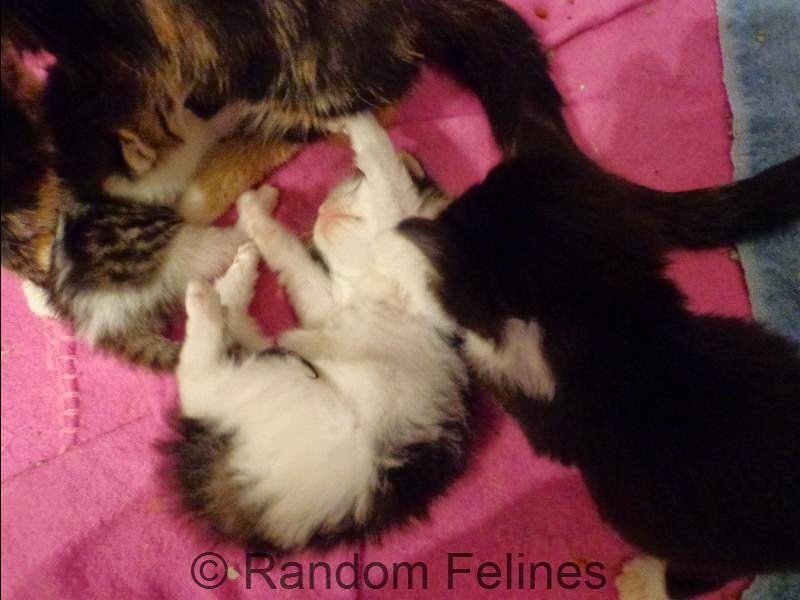 It's heartbreaking to hear about the kittens who don't survive, but I'm glad to hear Cass has taken to these three. I saw the picture of tiny wee Daiquiri on Facebook...wow...she's so little! You've certainly got your hands full! We are so relieved that Cass has taken the kittens in and is caring for them.